New here? Or perhaps you’ve been attending our Sunday services and are wondering what’s next. Why not stop by our Connect Points at our various service venues? Our leaders and ambassadors would love to meet you, help you find your way around church and pray with you. If you are a first-time visitor, or have just said the salvation prayer at the end of the service, we would like to bless you with some materials by Pastor Joseph Prince, which will help you as you start on your journey in Christ. Our care groups are a great place to share God’s love through the Word and fellowship in a small group setting. You’ll be encouraged in your daily walk with Jesus, build strong kingdom friendships and even have the opportunity to bless people through various community projects. We have many care groups all across Singapore that meet every other Friday. If you've made New Creation Church your home church, come fellowship with us! To join an English care group, sign up via NCC's Online Access Hub (NOAH); or call us at 6602 9329 (Tue–Fri, 9am–6pm). Note: Our care group hotline is only available to church members in Singapore. Water baptism identifies you with the death, burial and resurrection of our Lord Jesus Christ. It signifies your death to your old life and marks your new identity in Him. It is also a public declaration of your new birth and faith in His finished work! 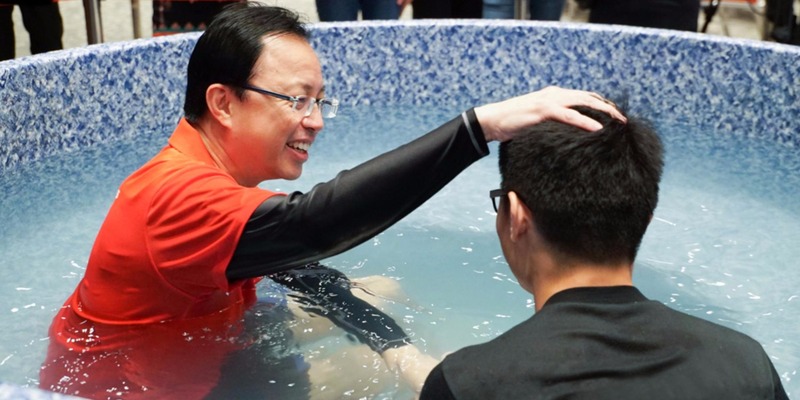 If New Creation Church is your home church, and you are 12 years old and above and have not been baptised before, you can sign up for our water baptism session. Sign up via our online church life system, NOAH. Registration is on a first come, first served basis and closes by Monday, 6 May 2019 or when the session has reached full capacity. Want To Be Updated On Upcoming Sessions? If you would like to be updated about upcoming water baptism sessions, you may indicate your interest here. We will notify you via email once registration opens. Please click here to view our FAQs. If you have any enquiries, please contact Pastoral Services at 6338 4555 (Monday–Friday, 9am–6pm) or email pastoral.care@newcreation.org.sg. We hold regular classes and seminars to empower you with biblical yet practical perspectives based on the finished work of Jesus. No matter what life stage you are at, there’s always room for you to grow and for God’s abundance of grace to abound! If you are interested to attend any of the classes, you may indicate your interest here. We will notify you via email once the registration is open for the respective classes. The classes are held twice a year. Singles will learn more about what God’s Word says regarding relationships and receive practical keys that will equip and enable them to grow in the area of relationships. The singles seminar is held twice a year. If you are interested to attend it, you may indicate your interest here. We will notify you via email once the registration is open. Couples planning to get married, come and find out what you expect in a marriage from a biblical yet practical perspective. The marriage preparation seminar is held thrice a year. If you are interested to attend it, you may indicate your interest here. We will notify you via email once the registration is open. Married couples who are expecting, come and be equipped with biblical principles and practical tips for a wonderful pregnancy. The prenatal seminar is held twice a year. If you are interested to attend it, you may indicate your interest here. We will notify you via email once the registration is open. Learn more about parenting your children with grace. Discover how to communicate and develop a wonderful relationship with them as you guide and support them through their growing years. If you are interested to attend it, you may indicate your interest here. We will notify you via email once the registration is open. To sign up or find out more about our upcoming classes and seminars, look out for our announcements. If you have any enquiries, please contact Pastoral Services at 6338 4555 (Monday–Friday, 9am–6pm) or email pastoral.care@newcreation.org.sg. If you have been attending our church regularly and your heart is stirred to make a difference in the lives of others, come volunteer with us! At New Creation Church, we believe that lives are being transformed and impacted eternally when they receive the gift of Jesus and know the length, depth and breadth of His love for them. This is what makes serving the Lord full-time even more purposeful and meaningful. We invite you to be part of our team of dynamic and passionate individuals whose talents are called to a higher purpose. Besides the competitive remuneration and benefits, you will find that we serve out of rest with cutting-edge excellence, as we put Jesus and His people at the heart of all that we do. If you are interested in any of the positions with the church, please download the application form and submit it together with your résumé to recruitment@newcreation.org.sg. Excellent illustration skills with a strong sense of composition, colour, movement, texture, etc. Candidates should have experience in Digital Marketing, Digital Project Management, SEO/SEM or have worked 1–2 years in a digital/tech/CRM environment. Fresh polytechnic or university graduates with relevant qualifications are welcome to apply. We also have job openings in our affiliates. If you are keen to apply for them, please download the relevant application form in the positions below and submit it together with your résumé to recruitment@thestar.sg (for positions in The Star Performing Arts Centre) or to recruitment@rockproductions.com (for positions in our other affiliates). For more information on our affiliates, please click here.